UAW on verge of breakthrough in south? CHATTANOOGA, Tenn. (PAI)-The United Auto Workers, long frustrated in their attempts to organize non-union plants run by foreign auto companies – so-called “transplant” plants – in the anti-union South, may be on the verge of a breakthrough at the 1,387-worker Volkswagen plant in Chattanooga, Tenn. There, news reports say, the union has signatures from a majority of workers on cards authorizing a recognition election – but with the explicit understanding that the vote, if successful, would not create a union local but a joint and elected labor-management “Works Council” to discuss wages, benefits and working conditions. Such Works Councils exist in Germany, by law, and workers elect their representatives to them. Establishment of such a council in the U.S. would be a first. But it would also represent the union’s first organizing success in years in the South. In the last several decades, foreign automakers opened many plants there, explicitly seeking to avoid unions. Meanwhile, the unionized Detroit-based automakers, Ford, GM and Chrysler, shed hundreds of thousands of UAW members. There are now so many auto workers in the South that one right wing Southern U.S. GOP senator recently claimed his region, not Detroit, is now the center of the U.S. auto industry. In a recent statement, the union confirmed that it is discussing the Works Councils with top VW management. News reports said leading Volkswagen executives flew to Chattanooga at the end of September to continue the talks. The union said VW officials, the company’s Global Works Council – which includes workers from every Volkswagen plant worldwide except Chattanooga – and the UAW met in Germany in late August. They discussed “appropriate paths, consistent with American law, for arriving at both Volkswagen recognition of UAW representation at its Chattanooga facility and establishment of a German-style works council.” But a recognition election is needed to OK the Works Council in Chattanooga, the union said. “VW’s Global Labor Charter and VW’s Social Charter go beyond international standards, establishing principles governing labor relations and remuneration systems, information and communication, training, occupational health and safety, social and ecological sustainability, labor standards at suppliers and, most recently, principles for the use of temporary workers,” UAW said. The charter also sets up annual labor-management meetings and “gives employee bodies the right to hold workforce meetings at least once per year” on economic factors, UAW said. 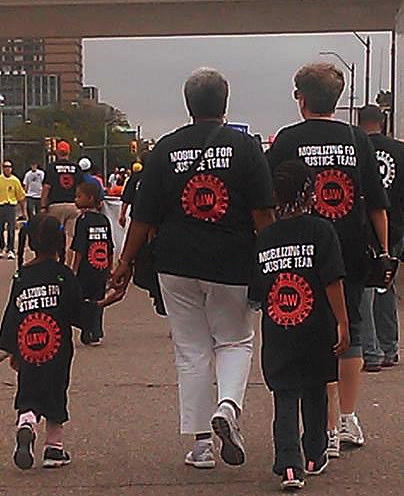 Photo: UAW workers and families heading to Labor Day parade. UAW Facebook page.